I don't think I could ever love again like I loved Lois. She killed all my illusions. I tried to get over it, but I can't. I am unhappy even after all you've done to try to make me happy, so why chase rainbows. 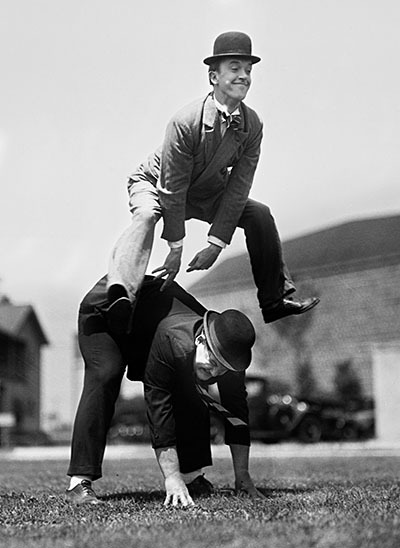 Stan Laurel and Oliver Hardy, Hal Roach M-G-M famous comedy team indulge in a game of leap-frog. A couple of guys who like to fish went down to the sea the other day, armed with $5,000 worth of fishing tackles. For seven hours they cruised up and down the waves off Catalina Island. But they didn’t catch a thing: not even a cold. One of the guys was Stan Laurel, who finds time to act, in the movies when he isn’t fishing. On the screen he’s funny. Fishing, he’s amazingly unfunny. The other was your correspondent, who fully expected the expensive array of placatorial gadgets to lure nothing short of a whale, and who half expected that more impetuous inhabitants of the deep would leap aboard the star's boat demanding autographed hooks. Neither of these things happened. Our primary objectives were swordfish, but apparently they were off somewhere else. Perhaps they were staging their annual summer fencing tournament and couldn’t be bothered. Stan and friends onboard the Ruth L.
But we had a jot of fun just the same. Laurel’s boat, the Ruth L., a 50-foot cabin cruiser, is one of the fastest on the Pacific coast. Hits around 35 knots, wide open. There’s a galley, sleeping room for eight, and a pair of comfortable fishing chairs at the stern. There’s a captain, too, a lanky gent with a frown face. Laurel wouldn’t know what to do if the engines sputtered and died, and he seldom takes the wheel himself. The skipper also baits Mr. Laurel’s hooks, rules the galley, and keeps everything amazingly ship-shape. The captain would wash dishes, too. If Laurel didn’t like that chore himself, But Stan doesn’t wash ‘em in approved manner. He grabs a plate like a discus, leans overboard, and lets the rushing water lick the plate clean. “Fun.” he said. We tried it, too. It was fun. 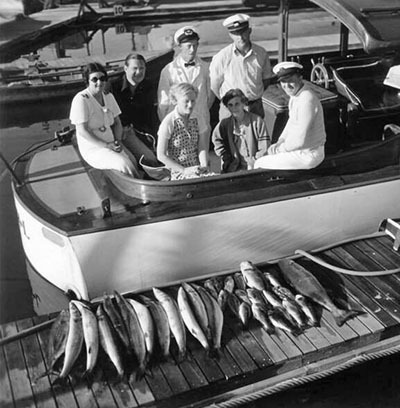 Ruth Laurel, the comedian’s pretty blond wife for whom the boat is named, also likes to fish. She accompanied us and, like all good anglers, didn’t moan because the fish wouldn’t bite. She dozed off occasionally, but otherwise her fishing deportment was class AAA. The amount of fishing tackles on Laurel’s boat is astounding. Two lockers are jammed full of leaders, feathered lures, hooks, canned bait, assorted rods, and an even dozen reels ranging in size from 50 to 500 yards. There’s even a live bait tank, hidden beneath an otherwise swanky leather chair. Laurel knows exactly what everything is for and he bandies a rod like an expert. He bought the boat a year ago from a Catalina tuna club member, and the equipment was included. He caught a 171 pound swordfish last summer, but hasn’t been able to hook another since. (See postscript.) He catches lots of sharks and smaller fish, though. If his swordfish luck doesn’t improve, however, Mr. Laurel is going to crate, or whatever they do to boats, and ship it by steamer to the gulf of Lower California. He'd like to catch a swordfish once a week, at least. And he hears that fishing is better there. “There are hundreds of ’em down there,” he says. “They say it’s terrific.” That’s just how nutty Mr. Laurel is about fishing. Laurel’s screen partner, the hefty Mr. Oliver Hardy, seldom goes to sea with the other half of the team. Hardy’s a golf bug, which doesn’t exactly make Mr. Laurel unhappy. “We can’t see the boat when Ollie gets on,” says Stan. Ruth and Stan Laurel pose with their record 258-pound catch. 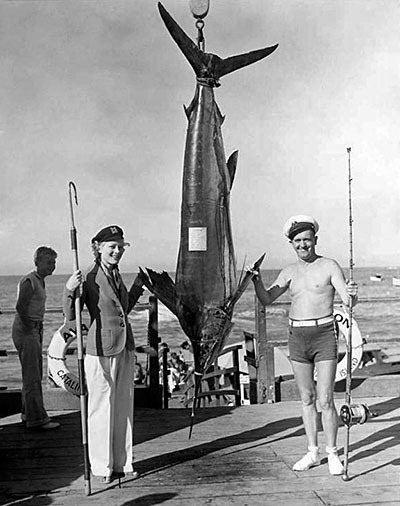 P.S.—A couple of days later Stan caught a 258-pound marlin swordfish in the record time of 44 minutes. The Catalina Tuna Club awarded him a gold button, and he’s wearing it now every place be goes. 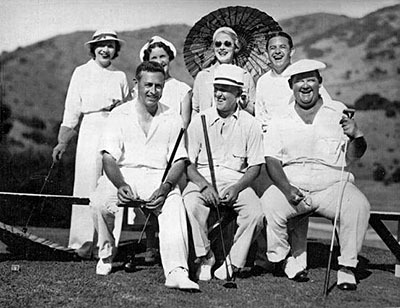 On Catalina, Otis Shepard (left) hobnobbed with the island’s famous guests, such as Oliver Hardy and Stan Laurel (center). At right is his patron, P.K. Wrigley, who owned the majority share of the island. Front row, left to right, P.K. Wrigley, Stan Laurel, Oliver Hardy; back row, Mrs. Hardy, Mrs. Wrigley, Mrs. Laurel and Jan Gaber. 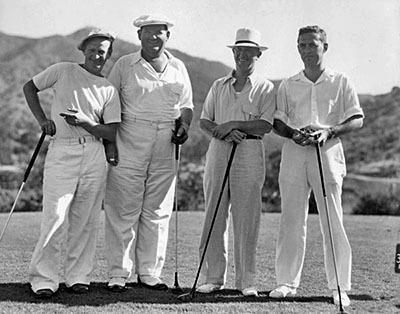 This photograph of the famous Hal Roach funsters was made on the occasion of a recent visit to Catalina Island when they were guests of its owner Mr. Wrigley.